Carded fly tying tool kit, an ideal starter kit. Designed by Australian anglers for our pelagic fish these good value jigs have a great sliding action. Dry flies, Streamers or Nymph fly boxes. Unique scissor action, snap opens with finger pressure. Ultra clear Slit Foam Salt Water fly boxes. 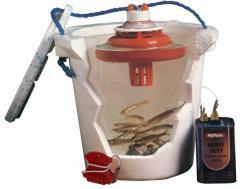 Superior to bubble-type models, this live bait aerator provides a much more effective oxygenation which keeps the bait alive longer. No-Knot Eyelet is a small barbed eyelet for leader connection. Excellent for changing lures or jig heads quickly. Very strong, made of spring steel. Z-Poxy is the very best two-part epoxy. Easy to mix, and cures in just 5 minutes. Pearl & Prism adhesive lure tape, available in 6 colours. 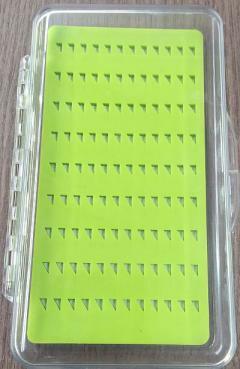 77, 108 and 168 slit foam clear fly boxes. Green and Pink, four sizes. 8" stainless steel Crimping plier. S/S 6" and 8" models with either a straight or bent nose. 5" Mono Cutters stainless steel.